The second and last moth that i found in Nosy Be airport,this time on a chair of departures waiting room. Maassenia heydeni is a moth of the family Sphingidae. It is known from Madagascar and the Comoro Islands. The wingspan is 50–80 mm. The forewing outer margin is slightly crenulated. 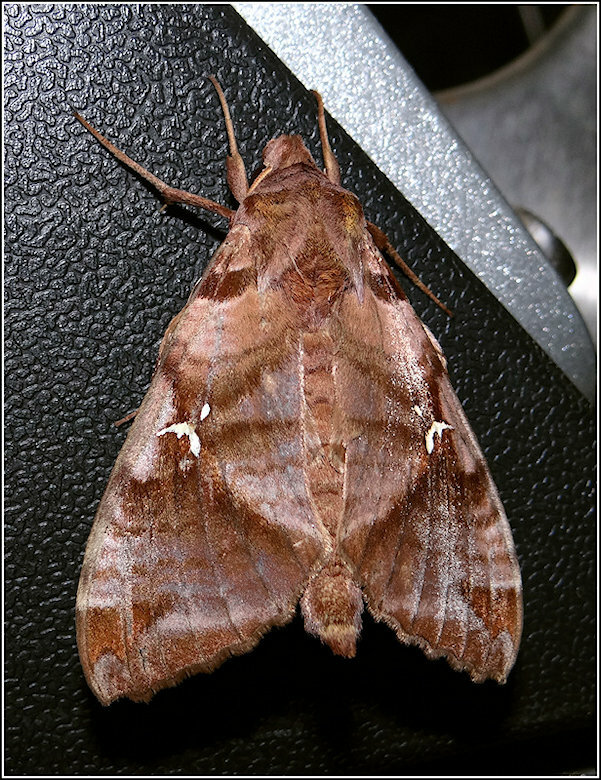 The forewing upperside ground colour is brown, with paler beige areas. The antemedian band and spots along the costa are paler. The basal band is dark brown, curved and not reaching the inner margin. There is a dark brown diffuse line running from near the middle of the costa to the tornus. The discal spot is composed of a two- to three-pointed silver spot with arms directed distally and a smaller rounded silver dot basally, which is sometimes absent. The forewing underside is brown with a conspicuous orange postmedian band and a darker marginal band. Interesting Moth with a informative NOTE, excellent catch. Very nice picture Luciano! Interesting species totally new for me! I look like that airport is a good place to find Moths!jeje! L'insecte est bien cadré. La prise de vue permet de voir les détails du papillon Maassenia heydeni. La lumière fait ressortir la beauté des couleurs. Bonne soirée. Congratulation 🎊 🎊 🎊 🎊 🎊 🎊 🎊 🎊 🎊 🎊 again for a new species. Well captured with excellent details and colors. Just I don't like Man Made articles in Nature Photography.